Adding learning tags to your stories lets you group stories together since you can filter or search for a particular learning tag, and view all the stories that contain it. This enables you to track learning over time. On an early learning service’s page you might, for example, filter stories by the tag ‘Literacy’ to show all children’s stories that have been tagged with ‘Literacy’. On a child’s page you might, for example, filter stories by the tag ‘Communication’ and see how a child develops in his/her communication skills over time. 1. On pages where stories are shown as tiles you'll see a learning tag ‘Filter’. Select a learning tag from this drop-down menu to view all the stories that include that learning tag. 2. 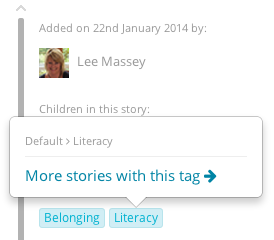 You can also filter by tag by clicking on a particular learning tag within a story to view the tag's description. At the bottom of the description, click the ‘More stories with this tag’ link and you'll be taken to a page with a list of all the stories that include that learning tag.